The Shirley-Eustis House Association is pleased to announce the opening of the Watkins Windsor Chair Exhibit! This exhibit was made possible by a generous donation of colonial and federal period furnishings from the estate of Joan Pearson Watkins, a noted potter and educator. She was also married to Malcolm Watkins, the first Curator at Old Sturbridge Village and later Senior Curator at the Smithsonian's National Museum of History and Technology. Their professional passion for American material culture is reflected in their personal collecting as well as this exhibit. A Windsor chair is simply a wood plank seat to which lathe-turned legs, stretchers, and spindles are joined. They were first made in England in the eighteenth century and were probably named after the town or castle of Windsor. Their popularity in America may be due to their low cost and durability and they were made from readily available local woods such as pine and maple. Only a steam box and basic assortment of tools were required. Windsor chairs were made in a variety of styles, were light-weight, and often painted a dark color. 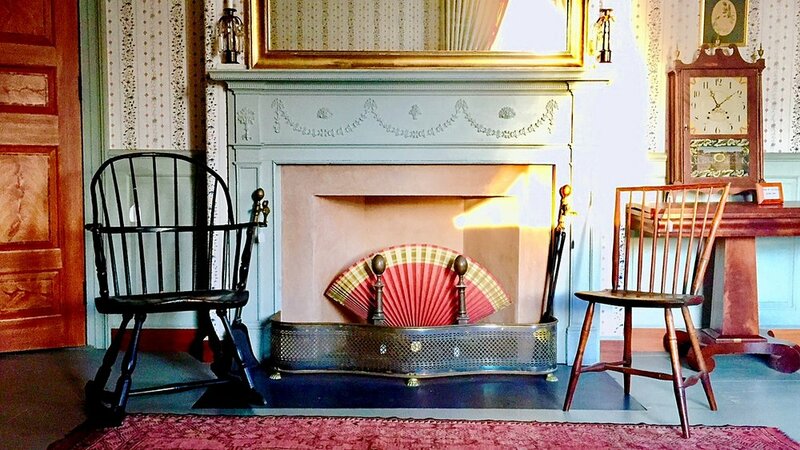 The Windsor chair exhibit at the Shirley-Eustis House includes 14 chairs from the Watkins bequest as well as two chairs from private collections. They illustrate most of the chair styles popular in the Northeast between about 1790 and 1850. The exhibit features informational posters, exhibit cases containing tools and chair parts, and a video showing the turning of chair parts and images of Windsor chairs in artwork. An informational pamphlet and exhibit catalog is also available for visitors. This engaging, interactive exhibit of the beloved Windsor Chair was curated by the Chair of the SEHA Education Committee, Steven Pendery. Elisabeth Pendery, was also a guest curator of the exhibit, responsible for the audio-visual production. Thank you to the Penderys for all of their hard work! The exhibit and catalog were made possible by The Shirley-Eustis House Association and a Fund established by the late Daniel J. Coolidge.